From OH! MATSURi, a film about Onbashira Matsuri (御柱祭), i.e., the “Sacred Pillars Festival”: Every six years for 1,200 years, people in Japan’s Nagano Prefecture risk life and limb to ride huge logs down a steep slope and transport the logs across a river to their destinations at branches of a shrine, where the logs are erected and remain in place until the next festival. For more information about the festival, see articles at The Asahi Shimbun and Japanese Architecture. 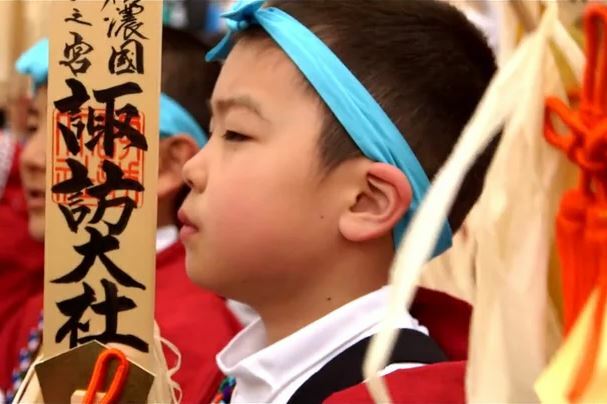 This entry was posted in Japan, Short Video and tagged Culture, festival, OH MATSURi, Onbashira Matsuri, Open Thread, Sacred Pillars Festival, The Coffee Shop, 御柱祭. Bookmark the permalink. Quite a spectacular effort by all concerned – a visual feast too. Morning, Nona. Did you notice that they weren’t all young guys? Riding logs down a steep slope … Men! !